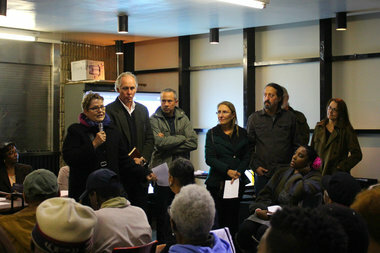 Members of the group Friends of Bushwick Inlet Park urged attendees to vote against the East New York rezoning plan, citing "broken promises" in the 2005 rezoning of Greenpoint and Williamsburg. BROWNSVILLE — Elected officials and Brooklyn neighbors impacted by the city’s previous rezoning plans showed up in full force Monday night, urging residents to vote against Mayor Bill de Blasio’s proposal to rezone East New York. Locals packed into the Brownsville Multi-Service Center for the standing-room only meeting with city officials, voicing concerns with the mayor’s manifesto to bring thousands of affordable units to the neighborhood. “Now that you have the Kool-Aid, I’m going to give you the real deal,” Assemblyman Charles Barron said to murmurs of agreement and applause from the crowd. “They’re going to tell you it’s affordable — affordable to who? The first gathering in a series of public review hearings included a presentation of the citywide Mandatory Inclusionary Housing program, which drew sharp criticism from Barron and his wife, Councilwoman Inez Barron. The proposal is part of two zoning amendments that seek to increase the number of affordable housing units throughout the city. Developers are given options that require portions of any new residential project to be below market-rate. Still, a provision allows for developers to waive or reduce the number of affordable apartments by pleading hardship to the city’s Board of Standards and Appeals. “That’s going to decrease what we thought would be housing that we could expect, that might be important to us,” Inez Barron said. “You know what they’re going to tell you? ‘We need a diversity of income.’ You know what that means? ‘We need more white people,’” Charles Barron told residents. The planned rezoning of East New York serves as a litmus test for the rest of the city as the first of 15 neighborhoods targeted by the de Blasio administration. The goal is to add or preserve 200,000 affordable housing units over the course of a decade. Over the past months, locals have called on the mayor to secure jobs for longtime residents and expressed fears of displacement. The sentiment continued Monday night, with attendees asking city representatives how they could guarantee the longevity of the community. “This city has an affordable housing crisis. I admire the mayor for making a full commitment to building affordable housing, but we cannot build our way out of this,” said Frank Castillo, a building service worker who spoke on behalf of Service Employees International Union, Local 32BJ. Members from the group Friends of Bushwick Inlet Park attended the hearing to share their experiences in the Greenpoint and Williamsburg rezoning. North Brooklyn residents spoke out against “broken promises” from the city, saying they have yet to see the completion of their nearly 30 acres of parkland promised as part of the 2005 waterfront rezoning plan. “It changes your neighborhood like you can’t even imagine,” said resident Kim Fraser. “With us, I really feel like it was a big bait and switch. This is the bait, tonight’s presentation, and then down the road, they’re going to switch it." Addressing locals' concerns, city officials cited a neighborhood development fund for East New York, which commits funding upfront for two projects — safety improvements and the revitalization of Atlantic Avenue, and the redesign of City Line Park. Representatives also highlighted workforce and job training, as well as the addition of MIH, which they described as a “major way to retain affordable housing," much to the skepticism of attendees. Earlier this month, de Blasio told a church in East New York that his plans for the area would help keep people in their homes. Brooklyn Community Board 5 will host the next public hearing on the rezoning plan on Oct. 28, 6:30 p.m. at Franklin K. Lane High School, 999 Jamaica Ave.
Borough President Eric Adams will also hold a public hearing at 6 p.m. on Nov. 23 at Brooklyn Borough Hall. Brownsville and Ocean Hill’s Community Board 16 is set to vote on the full proposal at the end of November.